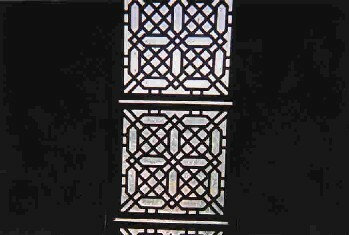 This photograph was taken in India and shows a wooden screen placed across a window. There are many beautiful designs decorating windows, walls, floors and ceilings in buildings in India. Try copying this design onto some grid paper turned around a quarter turn, like in the picture below. Here are the first few steps to get you started - or maybe you can see a different way to do it. Can you complete the design? Try making up your own now.